Kale has been enjoying a bit of a renaissance lately (and yes, we strongly encourage eating more of it), but beyond sautéing it or baking it into kale chips, many people aren’t really sure how to prepare it. 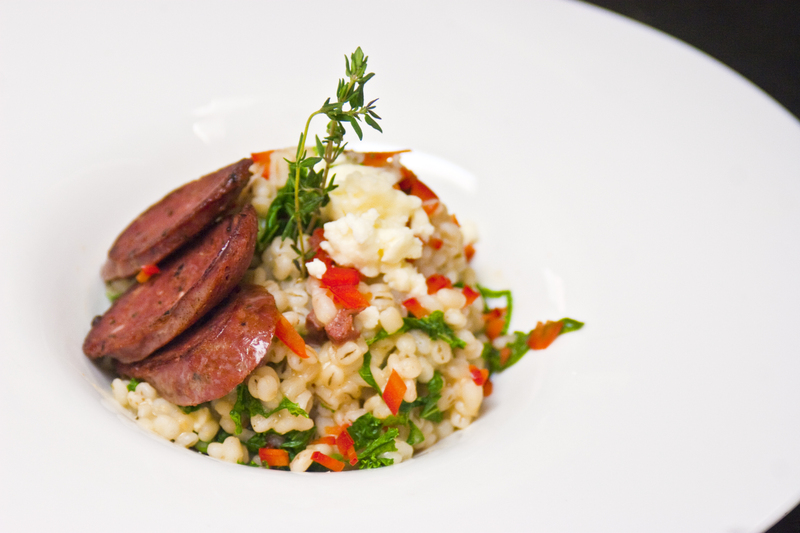 For this week’s Local Flavor, I’m offering up a really nice barley and kale risotto. It’s the perfect side dish for chicken or fish, but it’s also great as an entrée all by itself. You’ll notice the recipe does not call for Arborio rice; the truth is that risotto is a cooking method and not an ingredient. For this recipe, we’re using barley for a more unique flavor that really meshes well with the kale. Warm chicken stock over low heat. In a separate sauce pot, add olive oil, onions and the chorizo. Cook until onion is translucent and the chorizo is mostly cooked. Add barley and cook until coated with oil. Add the white wine. Cook until wine is completely incorporated into the barley. Lower heat to medium, and start adding one cup of warm stock at a time, stirring every 30 seconds as the stock reduces almost completely. Add more stock until it is all incorporated (approximately 40 minutes). When you get to the last cup of stock, add the red peppers and kale. Remove from heat and add the butter, thyme and feta. When butter is melted, salt to taste. Planning on spending this weekend on the slopes? Maybe you’ll take to the neighborhood hill with your kiddos for a little sledding? Or maybe, just maybe, you’ll have a nice quiet weekend to yourself with a great book. Whatever your weekend plans, is there really anything better than just taking a little time to enjoy a nice, warm beverage while the snow swirls outside? Mulled cider has been a winter tradition for centuries, but here in Vermont, we always like to add our own spin on things. So, here’s our special recipe, which, of course, features pure local maple syrup. Not only does it make the already wonderful aroma of mulled cider that much better, but it also adds a nice layer of sweetness to what I consider the ultimate comfort drink. Combine cider, syrup, cinnamon and cloves and heat thoroughly, but do not boil. Remove cloves and serve hot, garnished with a half lemon and half orange slice. 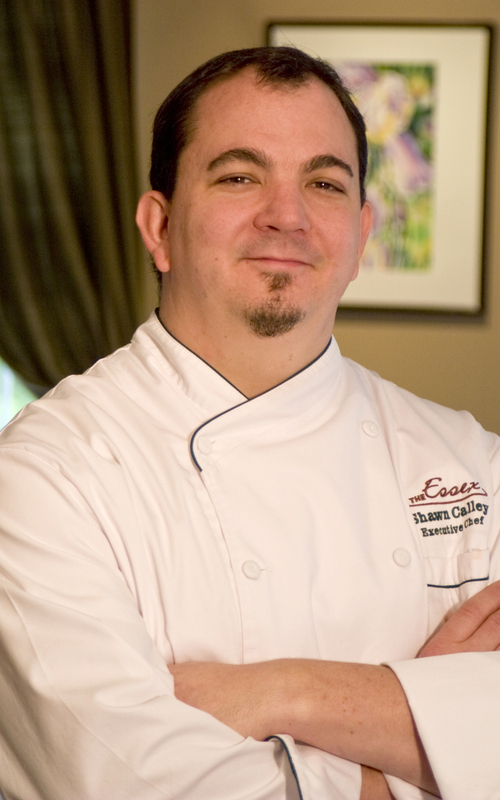 Written by Shawn Calley, executive chef at the Essex Resort & Spa. Written by Tom Brooks, director of food and beverage at The Essex, Vermont’s Culinary Resort and Spa. Sometimes you get inspiration in unexpected places. The other day I was concocting a recipe for this week’s Savorvore theme, “Backyard Pizza Hearth,” when I walked into the office of one of my colleagues. Immediately I noticed the marvelous smell of fresh pesto mingled with the unmistakable aroma of pizza. “Whatcha eatin’ there?” I asked. It looked good, smelled even better, and tasted incredible! (He offered a bite, and I just couldn’t refuse!) And just like that, I’d found my Savorvore recipe. Well, yes, it’s his recipe, but we’re all friends here, and what’s a little co-opting between friends? If you’ve never tried cooking pizza on a grill, it’s definitely worth giving a shot. Not only does your house stay cooler (and can’t we all use that right about now? ), it gives the pizza a nice outdoorsy (in a good way) taste. Just make sure you use a pizza pan, spray the grill liberally with non-stick spray, or brush it with olive oil. There’s not much that’s worse than having a big ol’ pizza stuck to your grill. And now that you have a basic recipe, feel free to try it with your favorite pizza ingredients. Saute chicken in olive oil over medium heat. Add fresh basil, salt and pepper. When chicken is almost cooked through, add mushrooms. Cook for another 2-3 minutes, and set aside. Set grill to medium heat. Roll out dough (sprinkle with flour so it doesn’t stick), and transfer to pizza plate. Spread the pesto onto the dough, add the cheese, and then top with chicken and mushrooms. Sprinkle another thin layer of cheese, and then place pizza onto grill. Cook for 10-15 minutes, until crust is golden brown and cheese is melted. Written by Tom Brooks, director of Food & Beverage at The Essex Resort & Spa. As the new director of food and beverage at The Essex Resort and Spa, I should start by quickly introducing myself. 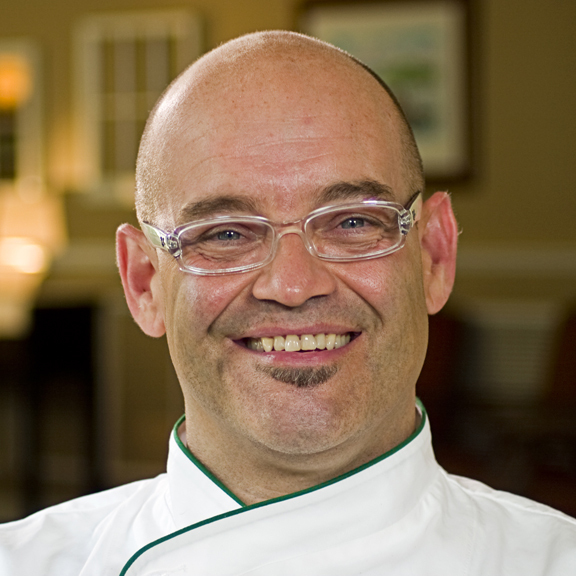 I come to The Essex after more than 20 years as an award-winning chef and caterer at establishments across the country, including the Ritz Carlton Hotel and the Four Seasons Hotel in Boston. After graduating from the Culinary Institute of America, I trained at Cordon Bleu of Paris. I look forward to sharing delicious recipes with you, with a sharp focus on local ingredients and farm-fresh options. In keeping with this week’s Savorvore theme of sharing food and books, my thoughts immediately turn to one of my all-time favorite children’s books, A.A. Milne’s 1926 classic “Winnie the Pooh.” Generations of children (and their parents, too) have enjoyed the marvelous escapades of the gang from the Hundred Acre Wood. Remember Piglet’s failed attempts to capture the elusive Heffalump, or the “Expotition” that brave Christopher Robin led to the North Pole? And then there was Pooh with his rumbly tummy and his arm always elbow-deep in the honey pot. Can you really blame him? Honey is a perfect natural sweetener — always excellent on toast, in tea, and drizzled over ice cream or pancakes. And where would children these days be without some honey mustard sauce to dip their chicken fingers in? Honey was first mentioned way back in the 6th century B.C., and it quickly became popular with the ancient Egyptians, Babylonians and the Roman Empire. It later showed up in the Aztec and Mayan civilizations before spreading into the colonies in the early 17th century. Here at The Essex, honey is a common ingredient in many Bakeshop goodies, including breads and pastries. And, yes, it’s featured prominently in our very own homemade honey mustard sauce. 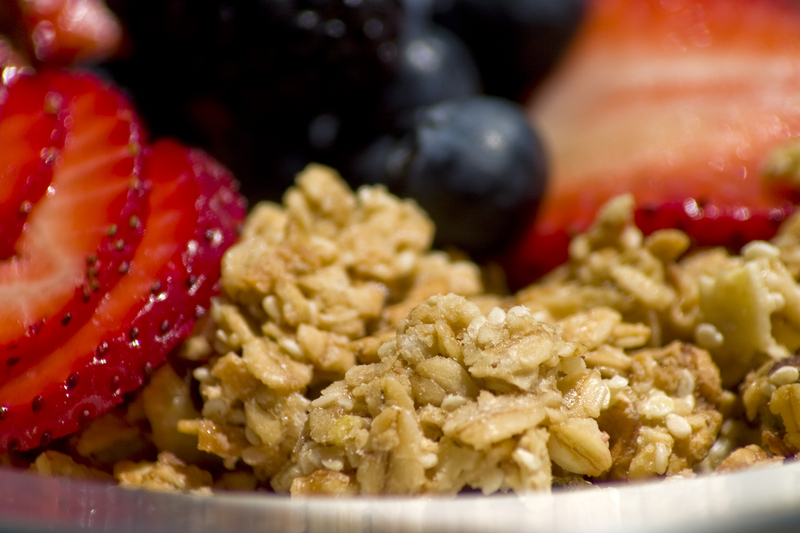 To celebrate Winnie the Pooh’s favorite food, here’s a recipe for The Essex signature Honey Granola. I hope you like it. Mix all ingredients in a bowl. Spread onto baking sheet lined with silicone mat (or a baking sheet coated with cooking spray). Bake at 350 degrees for 20-30 minutes until golden and dry. Break up and store in an airtight container. Grab a copy of “Winnie the Pooh,” and enjoy! Written by Chris Benjamin, director of food and beverage at the Essex Resort and Spa. I’ve never been much of a skier. I know, I know– born-and-bred Vermonter and not a skier? That’s tantamount to being born in California and not being much of a surfer. For some reason, though, I’ve never seen going down the side of a mountain with two pieces of wood hooked to my feet, dodging trees at high speeds as a good time. Now the base lodge, on the other hand? That’s my idea of fun. Good conversation, a warm fireplace, plenty of friends, and of course, plenty to drink. So I sit here wondering what kind of drink would appeal to the sophistication of skiers, be seasonally appropriate, and have a good name. Enter my right-hand man, Mark Elwell and his Aspen Mint Martini: Stoli Vanil, creme de menthe, White Godiva liqueur, and Baileys Irish Cream. If you will remember from previous articles, Baileys is a liqueur that has been distilled and includes additives such as nuts, flowers, fruit, spices, cream, and sugar. These are great flavoring agents, but also are quite delicious on their own as aperitifs or digestifs. Baileys has been around for a long time and is a great mixer for cocktails, including martinis and coffee additives. One of the primary ingredients in Baileys is Irish whiskey (which comes from the Celtic word usquebaugh meaning “water of life”). And what better place to make whiskey than Ireland; the oldest surviving distillery license was granted by King James I in 1608 to a distillery in there. Another marked characteristic of Ireland is its farms. Baileys relies on more than 1,500 hundred farms (and their 40,000 cows) to produce its cream. The cows are fed on four different strains of grass and are outside grazing more than nine months of the year. Through a clever process of homogenizing alcohol, Irish whiskey and cream, the products are emulsified along with some vegetable oil (to prevent separation). Baileys then adds cocoa nibs, vanilla beans, sugar and caramel to get the finished product. This week I’ve included two recipes for you: the Aspen Mint Martini along with Water’s Homemade Baileys Irish Cream, which comes from my friend Erin Waters. It’s a pretty good recipe to make ‘your own’ Baileys. Be aware, though, that it will separate after awhile– so I recommend you only make what you’re going to use in a sitting. Both are tasty, both will warm you up after the slopes, and both are easy to make. So, calling all ski bums! Please enjoy. Combine vodka, Baileys, crème de menthe, and Godiva in a shaker with ice and shake vigorously. Take a chilled cocktail glass and slowly turn while drizzling in Hershey’s syrup (creating a pattern). Strain Aspen Mint Martini into the cocktail glass. 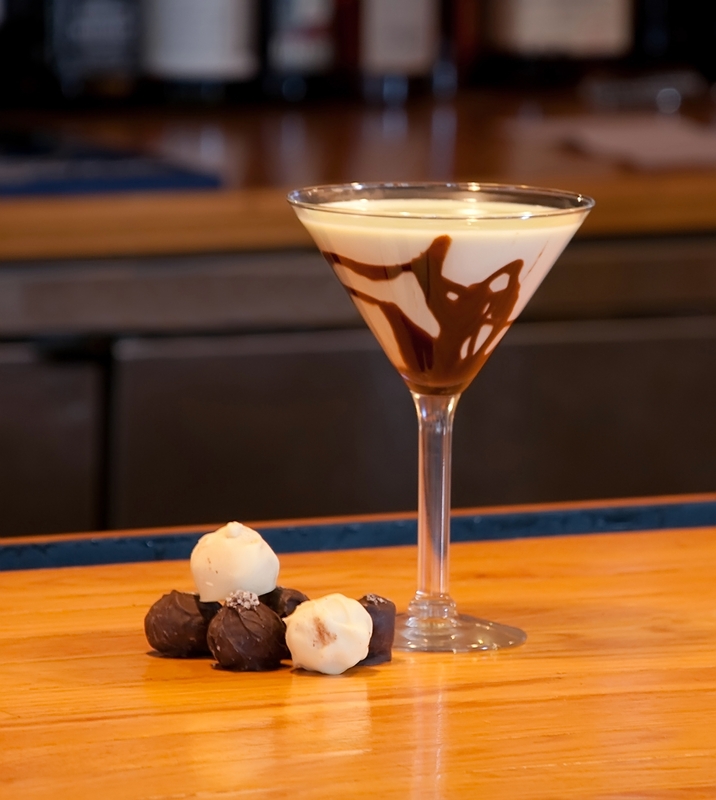 Serve garnished with chocolate shavings. Combine ingredients in a blender until incorporated. Refrigerate and enjoy. With the birth of the year, comes the beginning of a new decade as well. In the past decade, the trends in the beverages and liquor included micro-mixology (the beverage side of micro-gastronomy), pomegranate and other exotic fruit liqueurs, and the rebirth of classic cocktails such as the Sloe Gin Fizz, Sidecar, and Brandy Alexander. This coming decade will prove to be, I think, a continuation of these themes. Whatever the future holds for us, I hope we will continue to rely on the classic cocktails that bring full circle the tradition and memories we enjoy. In addition to Bloody Mary, one of the most classic cocktails served on New Year’s Day is the mimosa. The name is derived from the mimosa plant, whose flowers are very yellow and appear frothy at a distance. The standard mimosa, of course, is served with one part champagne or sparkling wine and two parts orange juice. But, as you know, I enjoy putting a little twist on things. There are many different classic ways to improve the mimosa, and all involve a little help from the spirit land. Try adding a floater of Grand Marnier, which ratchets up the alcohol content, flavor, and texture of the mimosa. Or try making a Kir, which classically is done by adding some Chambord to the top of the drink. Or you can try another rendition of the mimosa (and some say the original that was later plagiarized) called the Buck Fizz — add a little grenadine for a slight cherry flavor and a lot of color. Or you can go completely different and prepare the following recipe, the St. Germaine Sparkling Cocktail, which I have recently fell in love with. It goes great with Sunday brunch (we recently started serving these at The Essex, and they’re a hit). So have a safe and happy holiday, and the best to you for a wonderful 2010. Happy New Year!! Combine ingredients slowly and serve in a champagne flute. Great for parties and goes well in pitchers. Mix flour, baking powder, baking soda, salt, zest, and nutmeg in a bowl. Blend in butter with pastry blender or your fingertips until mixture resembles coarse meal. Add buttermilk and stir with a fork just until dough is evenly moistened. Do not over mix. Bring syrup and water to a boil in a 4-quart pot at least 10 inches wide and lower to a simmer. Add sliced apples. Using an ice cream scoop drop dough into syrup mixture, leaving space for dumplings to expand. Gently simmer over moderately low heat, covered, until tops of dumplings are dry to touch (15-20 minutes). Serve warm. Place the diced potato in a pot of boiling water for 5 minutes. Remove from heat. In a separate pot, fry the bacon on medium heat, stirring constantly. Add the onion and celery, cooking until transparent. Add the fresh tarragon, salt, and pepper. Cook for 30 seconds. Add the white wine and reduce about 3 minutes. When butter is melted, add the flour to make the roux. Add 2 cups of the chicken stock and mix thoroughly. NOTE: Stir constantly and keep at medium heat to prevent soup from burning. Add the other 2 cups of the stock, the corn, and the par-boiled potato. Bring to a boil and then reduce heat to a simmer for 20 minutes. Courtesy of Butler’s Restauarant & Tavern at The Essex Resort & Spa, a proud Partner in Education with New England Culinary Restaurant.